What options and features are available with portable chiropractic tables? Portable chiropractic tables can be essential for providing patient care in nursing homes, hospice settings, at sporting events, or for home health care providers. Since the portability factor prevents all the features of standard chiropractic tables, is it is important to carefully evaluate the feasibility of a portable model. Surprisingly, there are portable chiropractic table models that offer a range of features that make them a very practical and ease to use table. These tables can include a variety of features that include different heights, a face and head support that can be positioned in ten different variations, a foot and ankle extension for full body stretches and work, and padded hand rests for patient security and comfort. How large are portable chiropractic tables and how easy are they to transport? 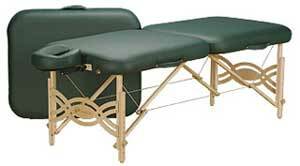 Depending on the specific size and type of portable chiropractic table, the portability factor will vary. There are models out there that offer a full 66 inch by 21 inch table surface with sold braced legs that fold up into an easily carried rectangular shape. These models generally only weigh 32 pounds, but amazingly, have been live weight tested with 2,500 pounds and static weight tested to 10,000 pounds. This is an important consideration, since patients will be moving about and different amounts of pressure will be applied to different areas of the chiropractic therapy table during treatment. Since the table is so well balanced and supported there is no concern with buckling or giving, providing maximum support and comfort for the patient. I work with a sports team and am putting together a recommendation for equipment. What options do I have for providing chiropractic services in a field house without the need for a costly adjustment table that cannot be moved when the team is on the road? Many sports teams require the use of a portable chiropractic table to treat injuries, muscle spasms and aches, as well as joint problems while traveling on the road. However, many teams cannot afford both a stationary table as well as a portable chiropractic table. A good option is to purchase just the portable option, which can be left in the field house or in a storage area when not in use. The other advantage to a portable option is that it can also double on the sideline or in the visiting field house or locker room as a treatment table. These chiropractic tables are very versatile, and can double as taping tables as well. With strong construction and a lifetime warranty on many models, they are a great investment. Portable tables are also easy to transport in most vehicles. They will certain fit into an equipment truck, team bus, or other mode of transportation. At less than 35 pounds, these tables are easy to move and locate as needed. Their small compact size when folded also makes them easy to store in equipment or locker rooms when they aren't required.